TWO BRAND NEW PREMIUM QUALITY CV BOOTS. NISSAN ALL MAKES AND MODELS. CV BOOTS ARE USED TO PROTECT THE CV JOINT. EVENTUALLY THROUGH WEAR AND TEAR THEY SPLIT, LEAVING YOUR CV JOINT EXPOSED TO CONTAMINATION FROM DIRT , ROCKS AND MOISTURE. MANY OF OUR COMPETITORS OFFER CHEAP AND POOR QUALITY CV BOOTS, WHICH DON'T ALLOW PROPER MOVEMENT OF THE SHAFT OR PROTECTION OF THE JOINT. OURS MAY NOT BE THE CHEAPEST. 2 x UNIVERSAL STRETCH OUTER CV BOOT KIT. 1 x REUSABLE FITTING CONE. 1 x 60cc CONE GREASE. 2 x LARGE STAINLESS STEEL CLAMP. 2 x SMALL STAINLESS STEEL CLAMP. PLEASE SEE THE LINK BELOW FOR FITTING INSTRUCTIONS. NO SPECIAL TOOL IS REQUIRED FOR FITTING. This is NOT a cheap CV BOOT KIT , it is built to LAST! Compare the image with others and you will see the DIFFERENCE. Once fitted, you won't have to worry about them again! Please see our feedback for this item. MEMBER ID: hezzy4261 FEEDBACK SCORE OF. RENAULT ESPACE DRIVESHAFT OUTER CV BOOT KIT NEW (#170674010208). TOYOTA CELICA DRIVESHAFT CV JOINT BOOT KIT GAITER UNIVERSAL STRETCH NEW (#160631183385). Il be back to do more buisness! SUBARU IMPREZA 1.6 1.8 2.0 DRIVESHAFT CV JOINT BOOT KIT UNIVERSAL STRETCH NEW (#160630591526). Ordered yesterday arrived this morning brilliant. MEMBER ID: gibbo49-2008 FEEDBACK SCORE OF. VAUXHALL MONTEREY 3.1 3.2 CV BOOTKIT UNIVERSAL STRETCH (#170676376727). MEMBER ID: maddownhiller FEEDBACK SCORE OF. GB to France within 2 days. MEMBER ID: vertpls69 FEEDBACK SCORE OF. MEMBER ID: cymbal7 FEEDBACK SCORE OF. VOLVO 850 CV JOINT BOOTKIT UNIVERSAL STRETCH (#170664659521). And many more happy customers! Other CV BOOT KITS also available. CUSTOMERS FROM HIGHLANDS, NORTHERN IRELAND, CHANNEL ISLANDS, JERSEY AND THE FOLLOWING POSTCODE AREAS. AB31to>38, AB43to>56, BT>ALL, FK19to>21, IM>ALL, IV>ALL. JE>ALL, KA27to>28, KW>ALL, PH5to>50, TR21to>25, AB42, FK17-18, FK22, G83, GY>ALL, HS1>9, PA>ALL, ZE>ALL AB42, FK17-18, FK22, G83, GY>ALL, HS1>9, PA>ALL, ZE>ALL. AND ALL AREAS OUTSIDE OF THE UK PLEASE ASK FOR. COSTS BEFORE PLACING YOU ORDER. Using the title or the compatibility table alone is not enough to ensure the part will be suitable as there can be more than one part that fits the same make and model. We do our best to list items with as many details as possible. So please check our details match yours and ask a question if you're not sure. The parts we sell are all brand new, unless stated, and some parts may have marks and scratches which may have been caused when testing, but will not affect the functionality of the part. Please note, we are not held responsible forany lost items that have been dispatched with a non-tracked service, (includingitems lost Outside the UK). We encourage all buyers toselect a tracked service on checkout as we find these to be the most reliablemethods. Non-mainland UK addresses include thg: HIGHLANDS, IRELAND, CHANNEL ISLANDS, JERSEY, ISLE OF WIGHT, BFPO. And the following postcode areas. We will ask for a letter from the mechanic with the business letterhead for proof. NOWARRANTY CLAIM ON PARTS THAT HAVE BEEN FITTED BY NON QUALIFIED MECHANICS. Please use a trackable return service and keep the receipt. RANGE ROVER SPORT/LAND ROVER SIDE STEPS.. VW TRANSPORTER T5 2.5 TDi COMPLETE DRIVE.. 4x MAZDA RX8 IGNITION COIL PACKS + NGK S.. LAND ROVER DISCOVERY 3 PROPSHAFT-PROP-PR.. BRAND NEW SIDE STEPS RUNNING BOARD OEM S.. The item "2x DRIVESHAFT FIT FOR A NISSAN CV JOINT BOOT KIT CONE BRAND NEW" is in sale since Monday, October 8, 2012. This item is in the category "Vehicle Parts & Accessories\Car Parts\Transmission & Drivetrain\CV Joints & Parts". 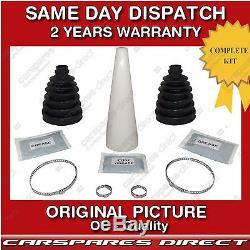 The seller is "carspares-direct" and is located in Ilford.